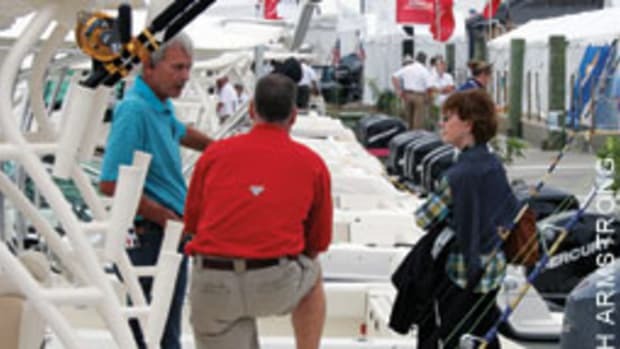 Buying used can be an attractive option for those looking to get into a “new” boat at a more affordable price. Depending on its age and condition, you still might have to put some money into the boat to ensure your safety and enjoyment. And if you wind up spending considerable money on the boat, it could be that it is no longer a more affordable option than buying new. I have been in the business of fiberglass boat repair and remanufacturing for more than 15 years, and my company, Metan Marine Restoration, is nationally recognized for the work we do. I often consult with potential customers who are looking to buy an older vessel to repair or restore so they don’t end up with a boat that might not be worth putting money into or a project that’s beyond their budget. Like any well-made product, a well-built boat from a reputable company is a good place to start when purchasing a used vessel. Anything can be repaired, but the decision comes down to the financial investment you want to make. I have many customers whose boats have been passed down from generation to generation, so the sentimental value is worth the investment to keep the boats seaworthy. “Classic” or “vintage” boats — for example, SeaCraft, Boston Whaler, Grady-White, Bertram — have proved that they maintain their value, and their value often rises as the years carry on, so long as they are properly cared for. 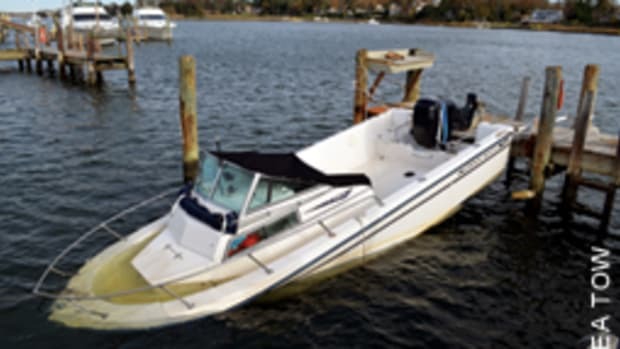 It’s a good idea to have a licensed surveyor inspect the boat prior to purchase. However, it’s doubly important to also have it inspected by the repair shop that will work on it so you can get an accurate estimate of the repairs. The cost of any work should be factored into the boat’s purchase price. 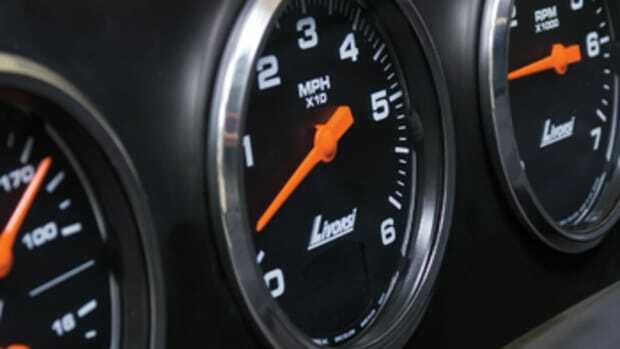 Be sure the shop you use is experienced in doing restorations and is familiar with the issues. There are several areas where close attention must be paid. Perhaps the most important is the structural condition of the boat. More times than not, when people bring their “good deals” to us, we have to tell them it will take thousands of dollars in repairs to simply make the boat safe. The condition of the stringer system, transom and deck are crucial. In all my years of restoring power- and sailboats — a wide range of brands and models — I have yet to find a completely dry transom on a boat that’s more than 20 years old. Some are in better shape than others, but the transom will have some sort of water content or rot. 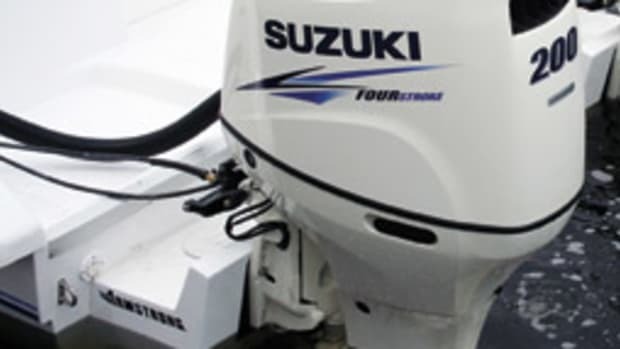 On an outboard boat, stress cracks on the top and in the corners of the transom are a sign the transom is flexing — not a good thing. 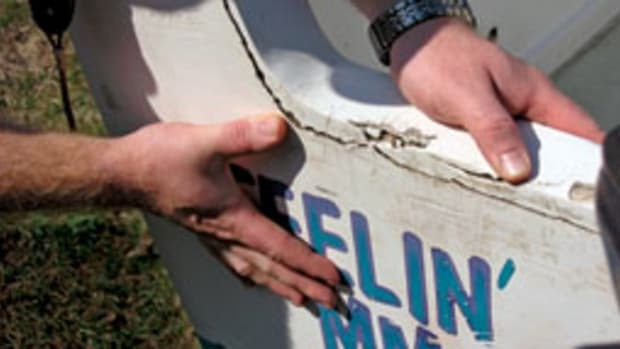 On inboard and sterndrive boats, where transom flex is not as prevalent, a core sample can be taken from the inside of the transom to check for moisture or rot. Deck and stringer system problems go hand in hand. Soft spots on the deck are a sign of rotted and delaminated core materials. Although these sometimes can be repaired, more times than not soft deck sections are an indicator of what is below the deck: a wet or rotted stringer system. Another area of potential concern is the boat’s systems. The engine and drive system should be checked first. If there are service records available, check when the most recent service was performed and whether the boat was seasonally serviced on a schedule. A certified marine mechanic can be hired to evaluate the condition of the propulsion package. 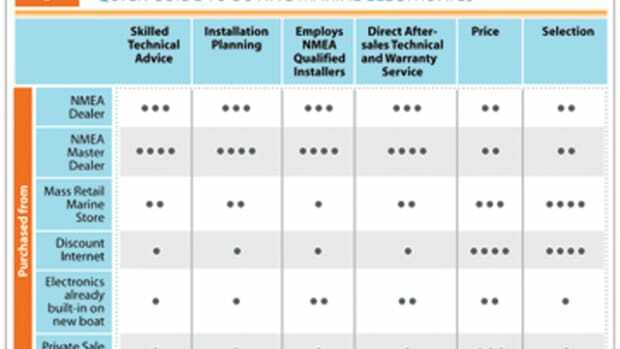 The electrical, fuel and plumbing systems also should be evaluated. Fuel hoses might have dry rot, clamps can be rusted, and electrical ground wires can be worn. With the plumbing system, check the condition of salt- and freshwater washdown pumps, holding tanks and heads, and the bilge pumps and hoses. You should also consider the boat’s appearance. If you’re going to make the investment to be sure the boat is safe and seaworthy, a facelift can bring the project over the goal line. For example, darker-colored gelcoats tend to fade through the years. You can bring back the gloss finish by wet sanding, buffing and polishing, but this is not a long-term solution. The result is short-lived and the fading often comes back within a year. The long-term solution is painting the hull. The process is more expensive, but it will ensure gloss retention for as many as 10 years. There are a lot of good fiberglass/restoration shops from coast to coast. Metan Marine offers a free consulting service (other than travel costs if the boat is more than 75 miles away) to look at any boat you may want to purchase. Free estimates on repairs and complete remanufactures are also offered. 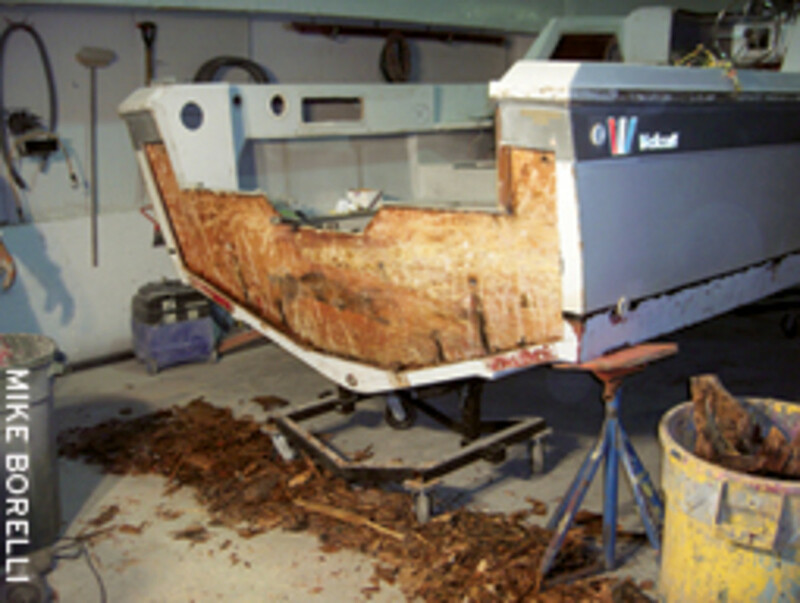 We are a national shop offering full fiberglass repairs and specializing in the complete remanufacture of boats under 32 feet. Transportation of boats from anywhere in the country to our shop in Halifax, Mass., is offered for a minimal charge. 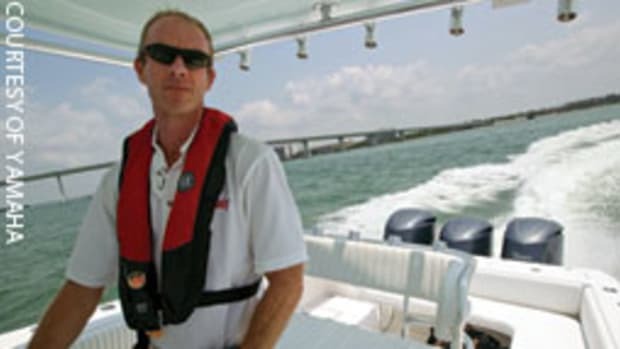 Check out our craftsmanship at www.metanmarine.com.